June has been hot here with no rain. We planted a garden earlier this week, but this morning when we stepped out to pick blueberries, the earth was dry as snuff. The weatherman promised, as they often do, that this would be a rainy week here, and to be fair, clouds have teased every afternoon. Yesterday, thunder rolled across the hills and hollows, but when I looked at the radar, the clouds were off to the east or west. The rain did not come. It was almost like our community had an umbrella. Jilda cooks daily, but this evening she had a hankering for a BBQ salad. I grabbed my shoes and keys for the 20-minute ride to the Green Top Cafe. It was a beer joint at the edge of a Walker County which was dry (it didn't sell alcohol) for many years. The Green Top had the coldest beer, and some say, the best BBQ in North Alabama. When the laws changed and Walker County began selling alcohol, the Green Top's monopoly on brewskies was lost, but the tasty BBQ kept the business viable through the years. I rolled the windows down in the truck on the ride down. It's hard to feel the day in the frigid isolation of a vehicle. The drive felt good with the wind in my beard. I called ahead so they'd have the food ready. 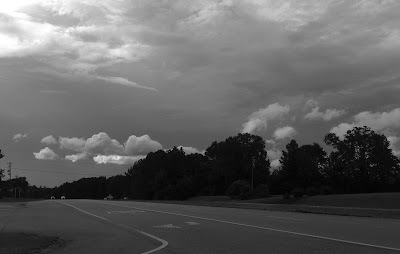 Pulling out of the parking lot, I looked back to the west toward our house, and the sky was dark with clouds. I called Jilda to let her know I was headed home. I knew by the sound of her voice before she ever said a word that it had rained. I smiled, but the thirsty soil rojoiced. What a pleasant surprise. I love the smell of rain on the dry earth in spring and summer. It takes me back. I like the snuff line! But in the end, I started wanting BBQ! TAke care, this was a sweet read. Rainy weather is my favorite. I love the clean smell of the air and the way colors are so clear and bright. As usual, I felt that I was there with you!! As it had been dry here in Ohio, I can appreciate this post. We have had a good rain now for a couple of days and I'm sure the gardens are appreciating it too. Hope you enjoyed that BBQ. Bless the rain. It's been dry here in Oregon.